This is a rectangular Kempshall Tyres porcelain sign. This particular Kempshall Tyres sign is white with red, blue, and yellow text. 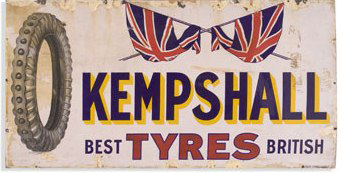 It reads, “Kempshall Tyres, Best British” and features two Union Jacks at the top and a tire along the left side of the sign.